You can now eliminate spongy pedal feel and stop in a shorter distance. Inline Tube power braid hoses can be made for any application. 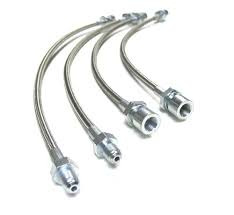 Hoses can be made longer or shorter than stock hoses and for any caliper or disc brake conversion. Whether you are making a brake upgrade or just doing necessary maintenanece, stainless hoses will increase the performance of your braking system. Street rods and custom applications can be made with just a phone call. Provide the sales staff with the length of the hose, caliper type and brake line size, and your custom hoses will arrive a few days later. You can choose between a clear coating that shows the braiding or a black coating that provides a more stock-looking appearance. Power Braid incorporates a special design for high strength and minimal volumetric expansion. It starts with a Teflon core which is wrapped in a Kevlar braid, follwed by an elastomer barrier. It is then strengthened further by the outer stainless steel braid. The Department of Transportation (D.O.T) has developed a set of standards (Federal Motor Vehicle Safety Standard), to which all flexible hoses must perform without failing under extreme conditions. In order to be certified, the hose must pass the "whip" test. Power Braid hoses have proved outstanding under testing conditions and surpass D.O.T requirements.